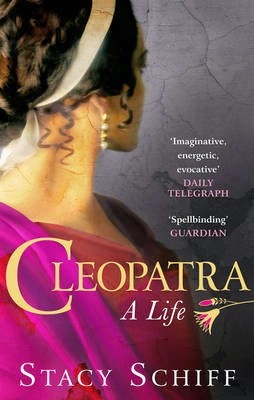 a book chick: "Cleopatra: A Life"
my take: I'm always, always, always glad to have read a biography once it's done (and I'm almost always, always, always a bit crabby reading it). For this one, I didn't realize it was a biography and I was looking forward to stealing away to ancient Egypt for a bit of romance, intrigue, epic battles, opulence ... in a novel-y sort of way. As in, reel me in and entertain me. The quotes on the back cover would have you believe this is an amazing read ... that might be overstating it. Stacy Schiff says she's not going to speculate on Cleo's life ... and yet, she must as she refutes the known historical records (written by men - Romans, even!) and movie versions to try to find a more credible, historically accurate version of the Egyptian queen. In her opinion. We had an excellent discussion ... chick Patty procured 6 copies plus questions from the Spring Lake Library. my verdict: Hmmm. Pretty good for a biography.